Ghost in the Shell: Where to Start? Ghost in the Shell is coming to theatres in 2017. For those who haven’t ever read or watched Ghost in the Shell before you might be asking yourselves, “Which version of Ghost in the Shell should I start with?” Well, we’re here to help! Read on for our definitive guide of all versions of Ghost in the Shell and find out which is the best version to start reading/watching. Ghost in the Shell first appeared in Young Magazine, a “Young Adult” manga magazine in 1989. One of the pioneering works in what would later be called “Cyber Punk”, it helped to define the genre. 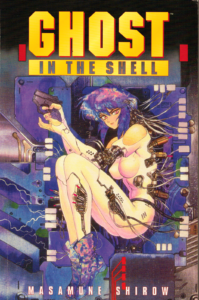 If you’ve read or watched anything that is remotely Cyberpunk, chances are it was influenced by Ghost in the Shell. GitS is written by Masamune Shirow and tells the story of a group of Cyber Police officers from Public Security Section 9. The group is led by Chief Daisuke Aramaki and commanded by Major Motoko Kusanagi. Most of the members of the team are cyborgs: their bodies have been enhanced (or replaced) by cybernetic components. Some of the members, notably Kusanagi and Batou, are “full cyborgs”: their bodies are completely cybernetic with the exception of their brains and spinal columns, which have been enhanced with cybernetic components. The main storyline of the series follows the team’s investigation of crimes committed by the “Puppeteer”, but this is secondary to the main theme of the manga: exploring what it means to be human in a world where the lines are becoming increasingly blurred between what is considered real and artificial. Full cyborgs are almost entirely artificial; the only thing to distinguish themselves from dolls (robots that look and behave as humans but with AI’s instead of brains) is their Ghost, another term for a “soul”. Hence the subtitle Ghost in the Shell (the actual Japanese title is 攻殻機動隊 Kōkaku Kidōtai, literally “Mobile Armored Riot Police“). 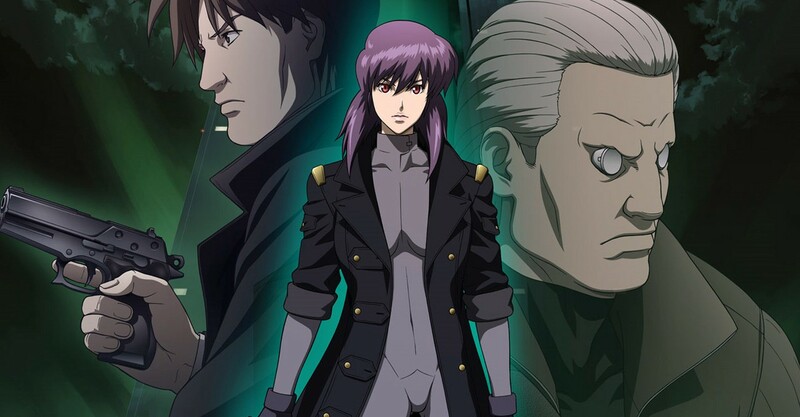 Focusing on themes such as existential philosophy, the problem of memory in a world where people’s minds can be hacked just as a computer can, as well as mortality and immortality (cyborgs are functionally immortal so long as they keep up with their maintenance), GitS is more than just an action manga. Rather, it’s a deep philosophical work that is written in a very accessible manner, even when read through the lense of a translator (unless you can read the original Japanese). One of the ways you can tell that GitS is different from any of the other manga and anime that have made their way over to western shores is not only the fact that it has received multiple adaptations, but that it continues to receive such adaptations more than two decades after it was published. Unlike many anime adaptations of manga (the ones in which scenes are animated almost in a shot for shot remake of the original panels with very little changed) the various GitS adaptations have each added their own unique perspective to the story. Compared to works such as Naruto, Attack on Titan or Berserk where much of the story is unchanged, each version of GitS is unique and offers a new perspective of the original story. This makes it very difficult to decide where to start first. Of course, the best place to start is the original manga, which had a very short run and can easily be digested in a weekend. The original GitS manga is rather short, especially when compared with another work by it’s author, Appleseed. Although not exactly seem as entry-level at the time it came out, today even a reader who has never consumed anything in the cyberpunk genre should be able to pick up the manga and dive right in without having too much of a learning curve. Part of this certainly has to do with how ubiquitous technology has become. Keep in mind that the manga was written in the late 80s, where personal computers were only just becoming a staple of the modern household. Cell phones were around, but smartphones really wouldn’t come around for another decade at the earliest, and when they did they were limited to things like the first palm pilot which was more or less a glorified calculator that could also read handwriting. But if you can put your mind into a reader from 1989, and you can see why many of the ideas put forth in GitS were revolutionary. Setting aside the idea of directly interfacing with the human brain, technologies such as GPS built into cars, instant messaging, and augmented reality are all described in the manga. It’s not that these technologies hadn’t even been invented yet, they had (with the exception of augmented reality that is) but they were limited to computer labs at MIT. The truly revolutionary idea was that everybody would have access to these technologies. Something else that makes reading the original GitS manga so enjoyable is by reading Masamune Shirow’s footnotes. Shirow put meticulous care into researching the technologies described in the manga, and each time a piece of tech is described Shirow gave us a little footnote explaining these technologies. I wrote “little” but some of these footnotes are one or two pages long. Reading the manga and the footnotes gives us a sense of the care and detail Shirow put into creating his story. One of the rules of writing fiction, particularly speculative fiction is that form follows function. Never is this anymore evident than when reading the manga. Every piece of technology, everything that the characters do, not only makes sense from a character perspective, but makes sense from a technological perspective. Sure, Shirow got a lot of things wrong when he envisioned the future technological development of the world, but he also amazingly got a lot of things right. The real benchmark that we should hold speculative fiction to is not about how correct Shirow’s predictions were, but rather how internally consistent they are. GitS is easily within my top 10 manga of all time. If you do choose to start reading with the manga this would be an excellent choice. Obviously you can’t do wrong with pouring over the actual source material rather than one of its various adaptations. If you do start with the manga don’t forget to pick up a copy of Ghost in the Shell 1.5: Human-Error Processor, which are a series of manga issues that were removed from GitS’s original run. The stories were mostly excised because they would’ve taking up too much space in the magazine. They do not tie them directly to the main plot of the manga, however they’re very interesting to read. You should also go ahead and pick up the sequel to GitS, Ghost in the Shell 2: Man-Machine Interface but a word of warning: it’s not exactly a direct sequel, but rather it takes place in the same universe. The characters are almost entirely new with a few exceptions, and without going into detail if you’re hoping to find another adventure involving the members of section 9 you had best look elsewhere. The 1995 film, titled Ghost in the Shell, was not only my introduction to the GitS universe, but it was my introduction to anime. As such, it holds a special place in my heart and likewise it’s hard to view this with an objective lens. This is literally the first anime that I ever watched, so take everything I’m about to write with a grain of salt. This film is a cinematic masterpiece. In order to understand how truly breathtaking this film is, you only need to watch the title sequence. Now imagine you’re a kid in the late 90s and you know nothing about GitS. What information can you glean from this title sequence? First off, we know that this is a story about cyborgs. Technology is going to play a vital role in this film. The haunting song in the title sequence is meant to instill a thoughtful, heavy tone into the film. Yes, this is a film about cyborg cops, but it’s going to be more than that, more than just an action drama set in the future. Not only are we seeing the construction of a cyborg, but we’re also seeing the birth of a person. This imagery is completely intentional, and it’s meant to give a sense of a person awakening for the first time, into a new form of life. As an aside, if you don’t see the obvious influence that this had on The Matrix, then I highly suggest you watch The Matrix again. In fact, The Matrix has more than a few scenes that are literally shot for shot remakes of ones from this film. One of the most brilliant things about this film, aside from the visual aspects, is the soundtrack. In a typical police drama one would expect to hear fast paced music during action sequences, especially with techno elements considering that this is a film set in the future. Instead we have the hunting, slow, soundtrack by composer Kenji Kawai. One of the things that’s noteworthy about the soundtrack is its absence during many of the fight scenes, or that when it is present it is not fast-paced, but slow, methodical, inching along beat by beat. I’ve written this before, but the power of a truly remarkable soundtrack is not to inject emotion into a scene (the scene should be able to tell you what emotions you are feeling without the need of the soundtrack) but rather to complement said emotion. And that’s exactly what this soundtrack does. This isn’t an action movie, it’s a philosophy movie with some action scenes in it. And the soundtrack exemplifies this. This film has all of the important parts of a good GitS adaptation. Center stage is the duality between being a cyborg and being human. Questions like “What does it mean to be human when you have an artificial body?” and “How do I know who I really am if I can’t trust my memories?” are at the forefront here. 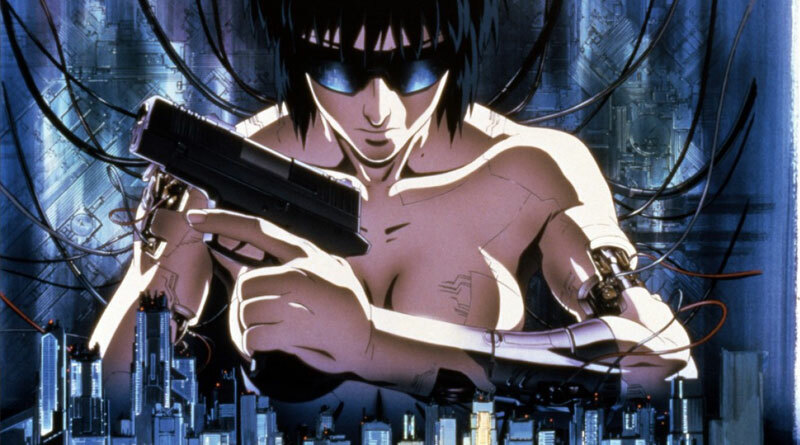 This film doesn’t just explore the cyberpunk genre; it helped to shape it. 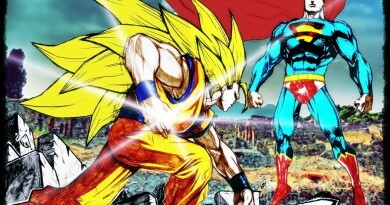 As far as adaptations go, this perhaps the most faithful to the original manga, but that isn’t saying much. The film roughly follows Section 9’s hunt for the Puppetmaster, and the conclusion is the same in the film as in the manga. But it’s a 90 minute film, so much is changed, and much more is left out. Still, as far as adaptations go, this is the best. If you’ve seen this film you should also watch its sequel Ghost in the Shell 2: Innocence. Not nearly as good as the original, it’s still a thoughtful film that explores the emotions and psychology of one of the minor characters in the first film: Batou. In 2002 we saw a 26-episode anime series based on GitS entitled Ghost in the Shell: Stand Alone Complex. 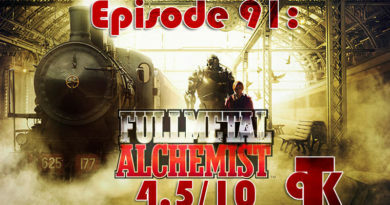 The subtitle is apt: the series has two type of episodes: “stand alone” episodes that are individual stories only loosely connected to the main plot, and “Complex” episodes that follow the main plot of the series which incidentally is a new story. Instead of searching for “The Puppetmaster” Section 9 is investigating “The Laughing Man”: a mysterious cybercriminal who doesn’t actually seem to exist. It’s a thought provoking series, and although it departs from the main story of the manga it features many of the side stories that the 1995 film left out. The anime was so successful it was followed by a “2nd G.I.G” of 26 additional episodes. This series contains ether “Individual” episodes which are stand alone, “Dividual” episodes which follow one of the two interwoven main plots of the season, or “Eleven” episodes which follow the second main plot. This season is almost entirely original but it is by far the best season. Featuring the best villain (Goda) and the best anti hero (Kuze) of the entire GitS world, it is definitely a must see. This was followed up by a film set in the same universe entitled Ghost in the Shell: Stand Alone Complex – Solid State Society. Although not particularly faithful, all of the main elements of GitS are present. As far as character development goes, I actually prefer this series to the original film. The original film is a cinematic masterpiece, and it is definitely something that must be watched, but there’s not nearly as much character development in a 90 minute film as there would be in two 26 episode series’. Of particular note is the raltionship with The Major and Batou, which obviously took influence from the film. This is the only version of GitS that I don’t actually like. It’s not that I dissed like the OVA series, but it doesn’t seem to have the feel of GitS. It’s a fun series, technically well done and interesting to watch, but as far as an introduction to GitS I would say this is probably the worst introduction to GitS. 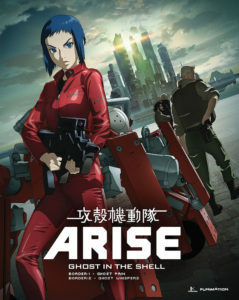 Arise is set as a prequel to GitS, and features stories centering on The Major as she begins to form what will eventually be known as Section 9. As such, it’s a little hard to tell which version of GitS this is supposed to proceed. Of course the obvious answer is none of them: it takes place in its own universe and has only tenuous ties to its predecessor series’. In this version we see a depiction of The Major as unrefined, Batou as to emotional (and that’s saying a lot for Batou) and the rest of the team as to distrustful of The Major. Although the overarching themes of identity and memory are present in this version, these actually take a backseat to the action which is in stark contrast to all other versions of GitS. Again, it’s a fun series and I’m interested to see its conclusion, but as far as an introduction to GitS it pales in comparison to any of the others mentioned in this list. I wouldn’t start here, I would end here. So where does this all leave us? Well if you want to go with the source material obviously you need to read the original manga. If you would rather see one of the animated adaptations, I recommend starting with the 1995 film, as well as its sequel. The 1995 film is what really put GitS on the map, especially for American audiences. Also, the film is probably the most philosophical of the various adaptations, and what’s truly at the core of GitS is its philosophy. If you wish to start with something that’s a little bit more in depth, then go ahead and watch the Standalone Complex anime series. Skip Arise, or rather, Arise should be watched last. 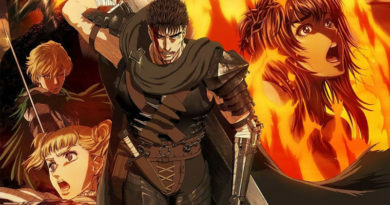 Berserk (2016) What the Hell Happened?